There is a "flybuss" (airport shuttle) taking you directly from the airport to downtown Trondheim. Shuttle busses are located outside Terminal A (domestic arrivals) and depart according actual plane arrivals. As of July 2013, the prize is NOK 130, and 90 NOK for students presenting a valid student ID. The payment is in cash (NOK) or by international credit card. Account for about an hour drive, depending on your final destination. The shuttle stops outside several hotels downtown. 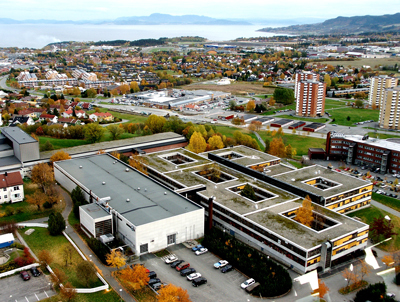 The nearest stops to the university main campus "Gløshaugen" are "Tempe kirke" and "Studentersamfundet", whereas the most convenient stop for visitors heading for the Marine Technology Centre at Tyholt is called "Strindheim". The local bus company to use to get to the Marine Technology Centre is called AtB. Use the “travel planner” (see English website) to find out your bus connection. Bus numbers 22 and 60 stop close to the Marine Technology Centre at “Valentinlyst” and “Magnus Berrføtts veg”. You may also preorder a "flytaxi" from Trøndertaxi that takes you to a location of your choice. However, there may be up to two other passengers in the taxi with different destinations, and the location of the end stop determines who gets off first (each of the three persons may have different end points). As of July 2013, the trip per person is NOK 370 and can be ordered from Trøndertaxi by dialing 07373 resp. +47 930 07373 from abroad. It should be ordered at least 24 hours in advance. A competing service is offered by NorgesTaxi (phone 08000) with varying fares depending on time and date. You will find all airport taxis to your left after exiting Terminal A or to your right if you are coming out of Terminal B (international flights). A regular taxi will cost at least NOK 800. Fixed rates are also offered.